I like chocolate cake at least as much as the next person, but after the Easter goodies have gone it can be time for a change from chocolate and Simnel cake. 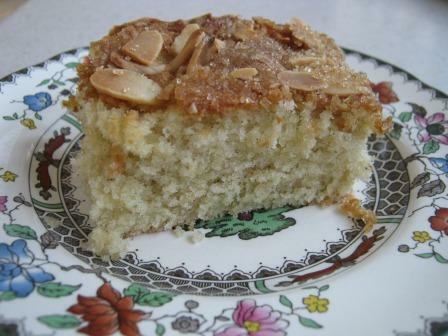 I had a small window of opportunity to bake this afternoon while I was making pizza dough and hit upon the Hairy Biker’s Cardamom Coffee Cake, from the Bakeation book and their visit to Norway. They didn’t make it on the show, so I can’t give you a link to the recipe. There may be others who have repeated it but I don’t do that. So we have a simple cake mix, with a slight twist which is handy if your butter is cold, you melt the butter before adding it to a mixture of eggs and sugar that are beaten with a hand whisk. In goes flour, cardamom, baking powder and milk. 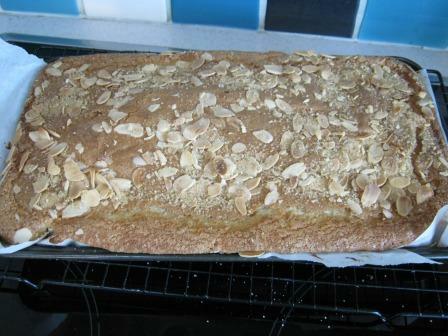 Then it’s topped off with flaked almonds and demerara sugar. Ever so easy! The result is very light and fluffy and I must say delicious.